The Super Energetic star Ranveer Singh has been spotted visiting sets of Golmaal again. Rohit Shetty who is busy shooting his fourth series of Golmaal was seen spending time with Ranveer Singh where Ajay Devgan joined them. 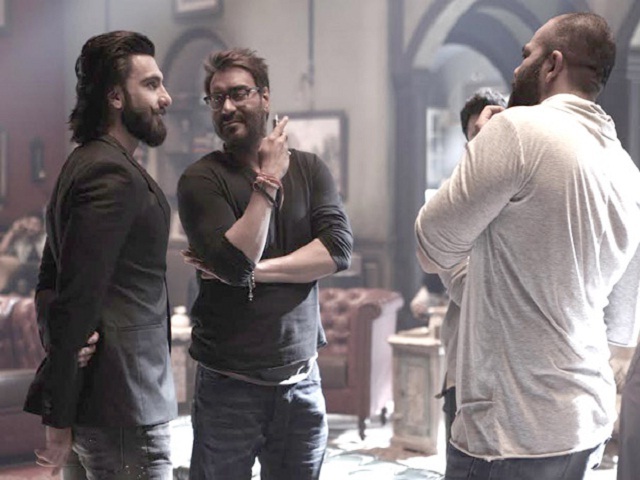 Ranveer Singh shares a great friendship with director Rohit Shetty. The two also worked in an advertisement of Ching’s Chinese which was an ad series of Rohit Shetty. Ranveer who was shooting a commercial in the same studio instantly came to the sets of Golmaal Again when he found the cast was shooting there. Golmaal Again will be released on this years’ end. Golmaal Again casts Ajay Devgn, Parineeti Chopra, Arshad Warsi, Tusshar Kapoor, Kunal Khemu, Shreyas Talpade, Neil Nitin Mukesh and Tabu in the film.